When what became known as the Perfect Storm struck the eastern seaboard in 1991, it left a path of destruction that caused tremendous heartbreak for thousands of yacht owners who watched their boats sink to the bottom. One of those boats was a 33-foot International One Design named Gypsy that went down in New York Harbor. The Coast Guard declared the boat a danger to navigation and ordered the owners to remove it. Searching for solutions, the owners soon found Bruce Dyson. Word had already spread in the IOD community about a man in New England, an accomplished sailor in Marblehead, Massachusetts, whose reputation for restoring vintage yachts could very well earn him the title The IOD Whisperer. "I got a phone call," Dyson said. "Seems there was an IOD that sank. Did I want it? It's free. Well, I said, I still don't want it." But eventually they convinced me. I figured, if I got it for nothing, the lead in the keel was worth three thousand bucks so I wouldn't lose out." Gypsy arrived by truck in 1992. The mast was in three pieces. "What had been a 33-foot boat was about 29. The transom was gone along with a foot of the stern and three feet of the bow. So it was considerably shorter," said Dyson, a tall, soft-spoken, mild-mannered man of 70 with a dry sense of humor. "The cabin and deck were gone. There wasn't a whole lot of boat recognizable except to the person who knows them. Enough of her was there to see she could be restored." Dyson had previously breathed new life into other IODs, including Greyhound, which he co-owns with friend and former sailmaker Norm Cressy, and Pompano, a 1939 yacht built the same year the IOD fleet was formed in Marblehead. Gypsy was a beauty, built in 1959 to 1960, and Dyson wasn't about to send her to the scrap heap. "There was a daunting amount of work to be done, but little by little she came together. We launched her in 1994," said Dyson, who has restored 17 IODs up and down the East Coast. In some cases he was hired, but mostly the work was a result of his passion for restoring boats that are later sold to appreciative owners. He also built for personal use the Jim Taylor-designed International 8-Meter Pleione, which he races competitively. Pleione, a 48-footer that may rank as the most graceful yacht in a harbor known for its head-turning hulls, took nearly five years to construct. She has been sailing for 10 summers and most recently competed in the Corinthian Classic Regatta in August. Although born and raised in Marblehead, a town where boats are part of the fabric of life, Dyson wasn't formally trained in restoration or construction. "My dad loved sailing and introduced me to it, but he worked a lot so he didn't get out as much as he would have liked. And my mom got seasick," he said. "Back in the day, we sailed a boat from the Marblehead Rental Boat Co. It was a double-ended keelboat, 17-1/2 feet long. Thirty-five years later I bought the same boat and restored it." As adulthood loomed, Dyson entered the working world. "I actually started life as a sailmaker, first with Ted Hood and later on my own, in friendly competition with Norm," he said. "I used to watch somebody do a job and think to myself, I can do that. If you put your mind to it, you can do anything you want." After selling the sailmaking business, Dyson and his wife, Leanne, started and ran a travel agency for 25 years and later ventured into home restorations. During that time they raised two daughters-Kim, a retired U.S. Navy fighter pilot who flew F/18s in four war zones and now restores British sports cars, and Kristen, who works at Kommand Helicopters in Connecticut. They have a grandson in the Coast Guard and a granddaughter in high school. Not surprisingly, aviation has been a family passion ever since Dyson, in his late 20s, took a demo ride aboard a glider in Salem, New Hampshire. "I got hooked immediately and ended up racing sailplanes for 30 years all over the world," he said, describing the series of gliders he owned-some bought, one built-ultimately winning the nationals with his last sailplane. A patient man of many talents, Dyson has also mastered the art of crafting IOD yacht half-models. He has completed 55 and four more are on order. 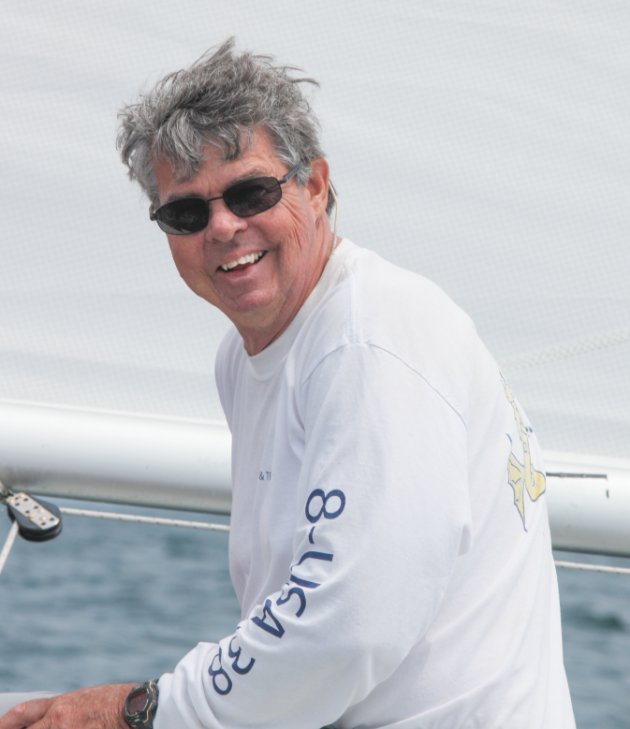 Throughout his busy life on the water, which includes his current post as vice commodore of Marblehead's Eastern Yacht Club, he has somehow managed to participate in the Fastnet and other prestigious ocean races while accumulating a slew of line honors. In 2011, Dyson was winner of the IOD class at Marblehead Race Week and recipient of the Norman E. Cressy Trophy. "You don't win that for being a good guy," he said. "You win it for doing a good job out there." Over the years he has won Bermuda Race Week aboard different boats, the IOD World Championships and the International Tempest North American Championships. He has raced with and against Dennis Conner on many occasions, and crewed for David Curtis to win the Etchells World Championships. "Right now, a friend of mine and I are building a 24-foot Carolina-style, center-console runabout," he said. "After that, who knows? I'm not done yet."